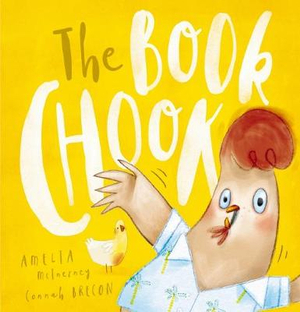 When Susanne Gervay invited me to be one of the book presenters for my debut book, The Book Chook (illustrated by Connah Brecon, Omnibus Books-Scholastic) as part of this year's SCBWI conference, I was thrilled! The previous conference (held in July 2016) was the first book-related event I ever attended and if someone there had told me that the manuscript I was having critiqued that day would be published by Scholastic and that I'd be launching it at the next conference, I think my curls would have stood straight. And if they had also told me that I'd have five books contracted by the time the next conference rolled around, I think my hair would have fallen out. Back in 2016, I didn't know a soul in the industry. I'd just moved back to Australia (again) and this time I was not only toting another dual-citizenshipped baby, but a new-found obsession for writing kidlit. I'd been writing the way I thought all writers wrote, all housebound and hermit-like. I wrote in time snatched between caring for my baby, preschooler and kindergartener, and around scouring the internet as I educated myself in all things writerly. Grounded by my tiny pink people and the long white months of snow, I was happy with my solitary pastime. But I clearly remember the feeling I got when I stumbled across a certain strangely-acronymed organisation online. I was excited that such a community existed. And in Australia, too. Once settled back in Australia, I sought out this 'SCBWI', hoping to improve my craft, learn about the industry and make some writing friends. Or at least talk to someone about our shared passion. I paid my membership, bought a ticket to the conference, and because I'd been hanging on to a manuscript for a year and a half, decided to jump right in and book myself a critique while I was at it. Then I had my assessment with Tara Weikum, the conference's Key-note speaker and Vice President of Harper Collins USA. (Anyone for a swim in the deep end?!) I remember thinking that despite Tara's incredible experience and credentials, she might not be the best fit for me, seeing as she was American and mainly focussed on YA, and I had written a rhyming picture book about a 'chook'. I was wrong! She gave me an incredibly insightful critique, and although one piece of advice she offered seemed impossible (because of my already-burgeoning word count) I tried implementing it on the train ride home and subsequently ended up rewriting the manuscript. Prior to the conference, I thought my manuscript was as good as I could get it to be, and I was attached to each line of rhyme. I was quite surprised that with the small nudge, I actually enjoyed rewriting it because the story was so much better for it. Tara also gave me some helpful feedback on another picture book manuscript I showed her at the critique. Both of those picture book texts (and a further two) went on to be contracted by Clare Hallifax, whom I heard speak that day and then met at another SCBWI event soon after. I signed with my agent, Jacinta di Mase, after flying down to Melbourne to meet her at yet another SCBWI event where she was guest speaker, some weeks prior to KidLitVic. My fifth picture book is coming out with Allen and Unwin in 2020 and although that submission went through my agent, I had previously met Anna McFarlane... you guessed it...at a SCBWI event. Oh, and I got the idea for my fourth book on a SCBWI Sketch and Scribble day… I could go on! Since that fateful day in 2016, I’ve been going to lots of kidlit events and the highlight is always catching up with the vast network of creative friends I've made through organisations like SCBWI. My heartfelt thanks to the SCBWI team for their contribution to children's literature in Australia and the warmth, generosity and opportunities they extend to the members of our community. Amelia grew up in Melbourne, but now lives just outside Sydney in the Blue Mountains. She spends her days writing kids' books, staring out the window thinking up stories for kids' books, and occasionally just plain staring out the window. When she's not writing, thinking or staring, Amelia likes to help people and also cover them with gel, which makes her other job (doing ultrasounds) perfect for her. Amelia also enjoys doing yoga and snorkelling, but not at the same time because that's really hard. Amelia has three kids, two hermit crabs and a husband.